Londonist You Probably Pass This Building All The Time... But Did You Know About Its Fishy History? 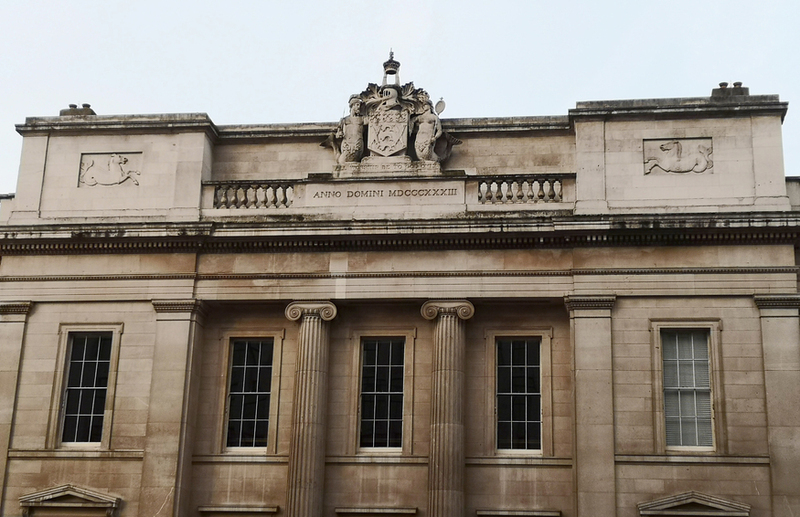 Travelling across London Bridge towards the City, you might have caught a glimpse of the stately Fish Hall. Then again, perhaps not. Anywhere else, its neoclassical façade would be the centre of attention, but here, it has to compete with the likes of Tower Bridge and all those glistening skyscrapers. 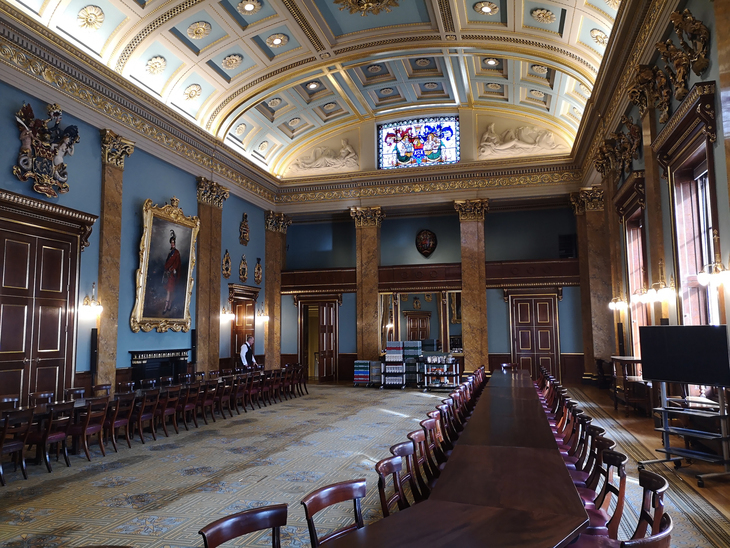 Fish Hall belongs to The Worshipful Company of Fishmongers, one of the Great Twelve City Livery Companies. 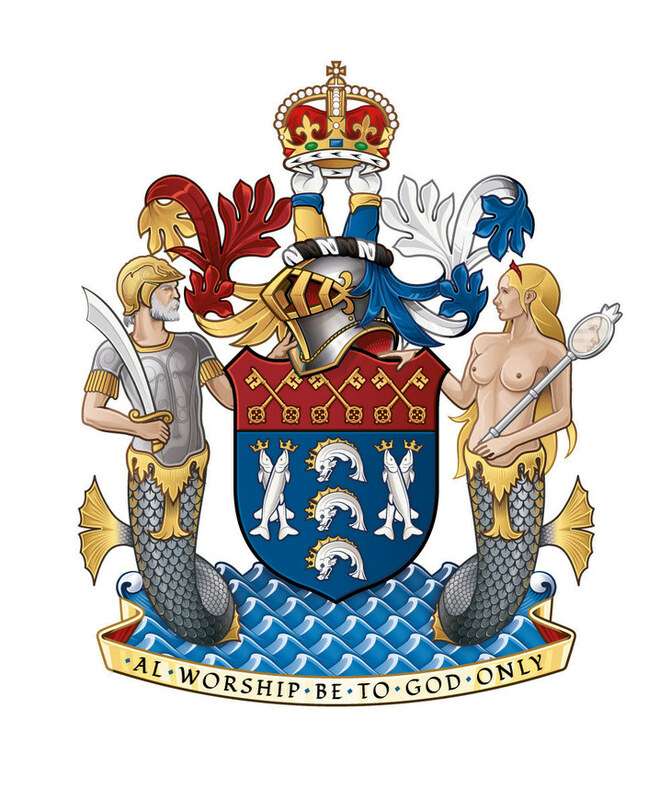 Unlike many of the 110 Livery companies still in existence, the Company retains its original function, which is to work with organisations associated with the fishing industry (e.g. the Salmon & Trout Conservation and The Rivers Trust) together with funding educational and charitable projects. In far-off days, when the City was one loud street market, different trades were organised into specialist guilds that established good working practice while also holding a monopoly on their craft. To flog fish, you had to be a guild member. The Saltmongers’ Coat of Arms, pre-1537. In the shield you can see St Peter’s keys resting on azure blue; beneath them are three silvery fishes on a crimson ground. Compare it with today’s coat of arms, where the pattern is reversed: the saltfish are accompanied by two pairs of stockfish on azure blue with St Peter’s keys floating above on red. It was the flourish of the coat of arms on the façade of Fish Hall that first caught my attention. The building is the third hall near this site; it was designed by a 28-year-old architect Henry Roberts, who won a competition in 1831 to build it after the second hall was demolished to accommodate the new London Bridge. 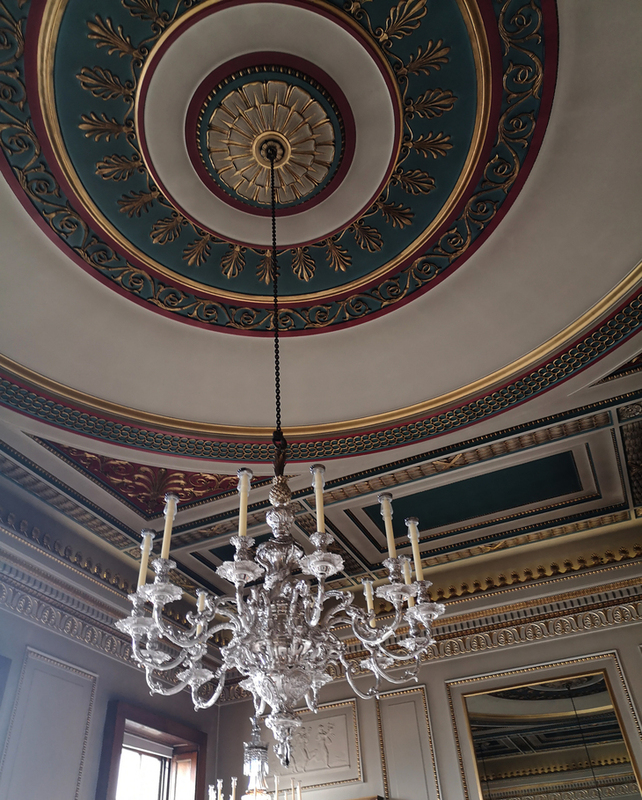 Roberts’ design became the grandest Greek Revival construction in London, and he might have continued in this vein had it not been for his next commission, a home for destitute sailors, which led him away from posh property in favour of social housing for the poor. Marble statue of Fisher Girl in the courtyard by Alfred Turner. The Hall extends down to the wharf where the fishermen worked, unloading their fish for sale at Billingsgate and Queenhithe market on the opposite bank of the Thames. 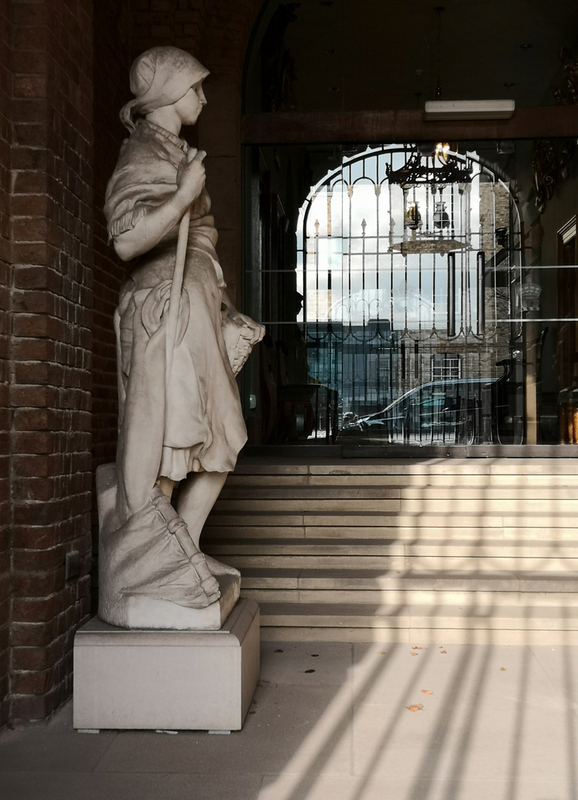 You don’t see this anymore but here in the courtyard are Alfred Turner’s marble statues of a fisherman and fisher girl. They face each other in a stony stand-off, lapped by shadows and sunlight through the railings of the gates. 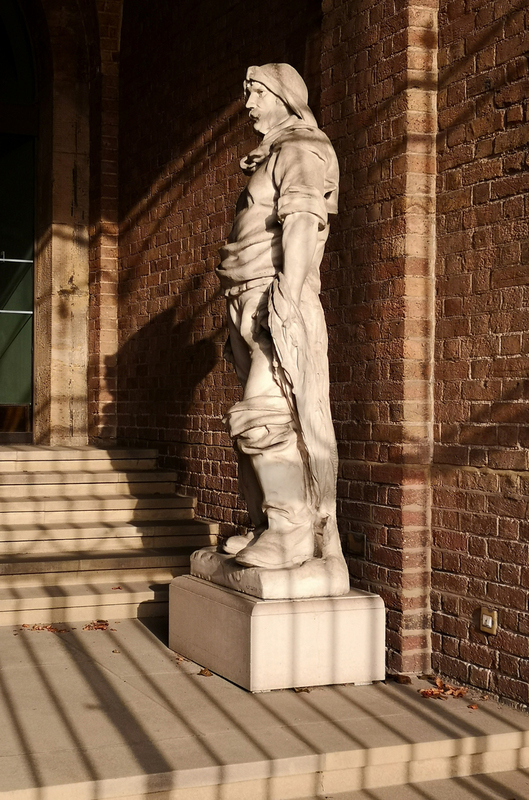 Marble statue of Fisherman in the courtyard by Alfred Turner. The entrance hall is awash with salmon pink walls, anchored by Aberdeen granite columns, with gleaming oak doors and marble mosaic floors. The sounds here are not of gulls over the river but the gentle tick of a grandmother long clock in the corner. Security back in 1834 was upheld by the porter. He sat at the door in a hooded chair with a drawer beneath its seat to hold his vittles and a metal box for hot coals to keep him warm on duty. 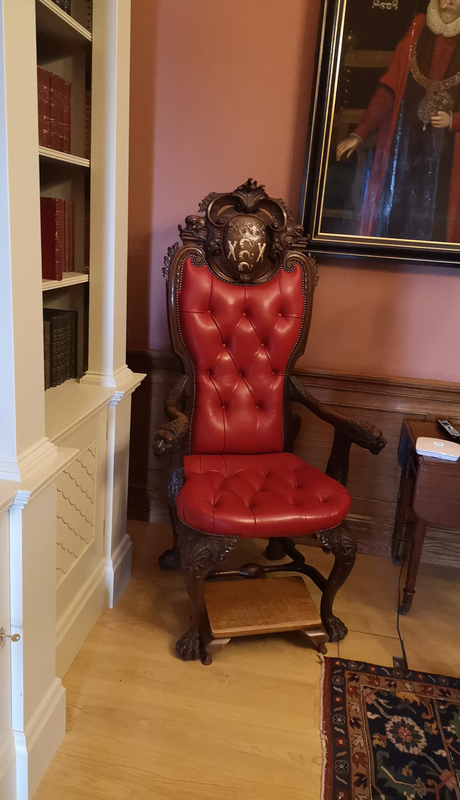 The chair is now inside under the watchful eye of the reception desk. There are fish and wave motifs aplenty in the foyer. Some you might miss, but not the Scabetti Shoal743 light sculpture that hangs from the ceiling at the entrance. 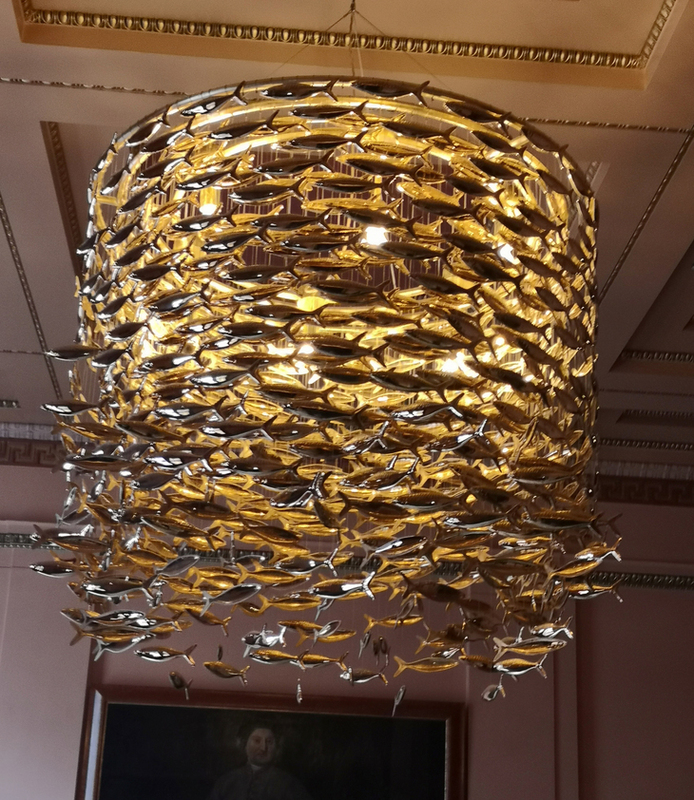 Commissioned by the Company in 2015, its 743 bone china fish are coated in 24 carat gold; their number represents a fish for every year since the Worshipful Company of Fishmongers was granted its first Royal Charter in 1272. The life of the fishmonger might be hard, wet, and cold, but his corpse got star treatment. An elaborate fringed early 16th century funeral pall, that travelled to churches across the country to envelope the coffins of deceased members, is one of the highlights of the collection. Looking like a narrow coverlet for a bed, it’s embroidered in gold and gilt thread with sword-wielding mermen and mirror-bearing mermaids, accompanied by the patron saint of fishermen, St Peter, who is handed the mighty keys to Heaven by a bejewelled Christ in ruby robe. 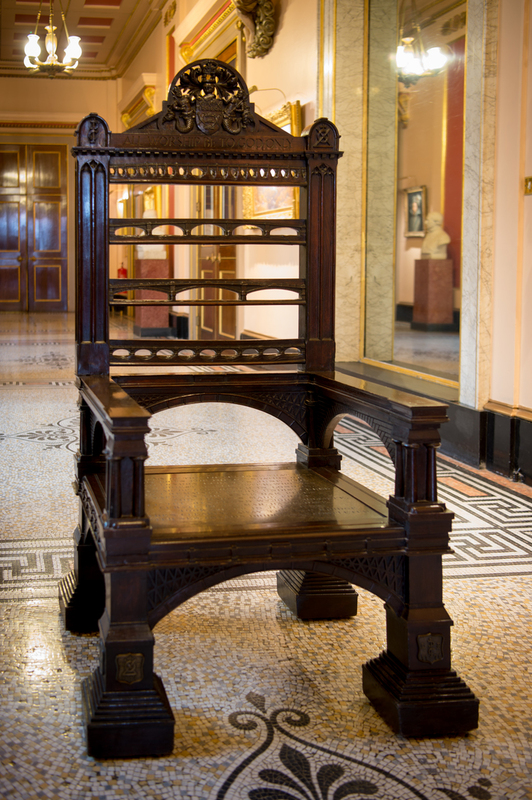 Next to the pall is the ceremonial London Bridge Chair, the seat of which is made from the stone of the old medieval bridge erected in 1176. 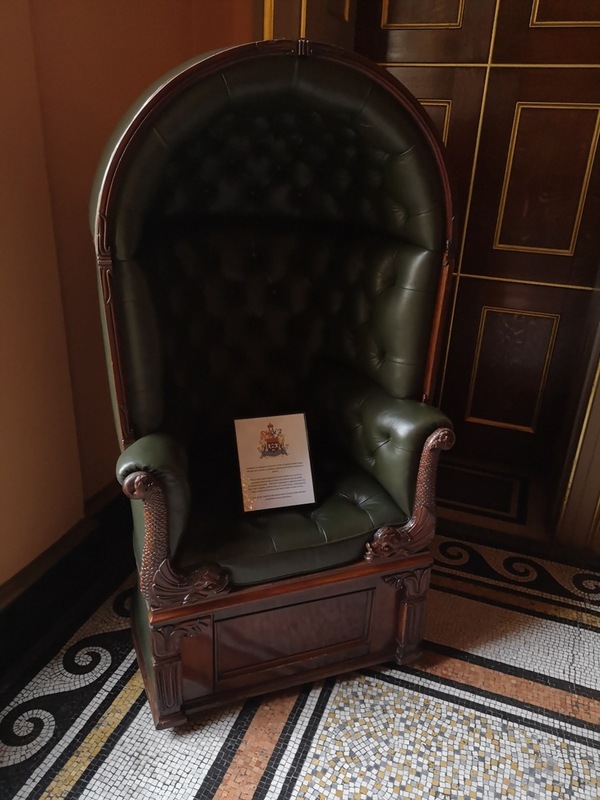 The chair was commissioned in 1832 by the Reverend Joliffe and presented to the Company 16 years later to celebrate Lionel de Rothschild, a Freeman of the Company, becoming the first Jewish MP in the House of Commons. The back of the chair comprises four bridges representing two versions of London Bridge, Waterloo Bridge and Southwark Bridge. The seat is made from the foundation stone of the old wooden bridge. In a way, the chair is a bridge to the history of this ancient crossing over the river. Before the Romans built the first London Bridge, Londinium did not exist. 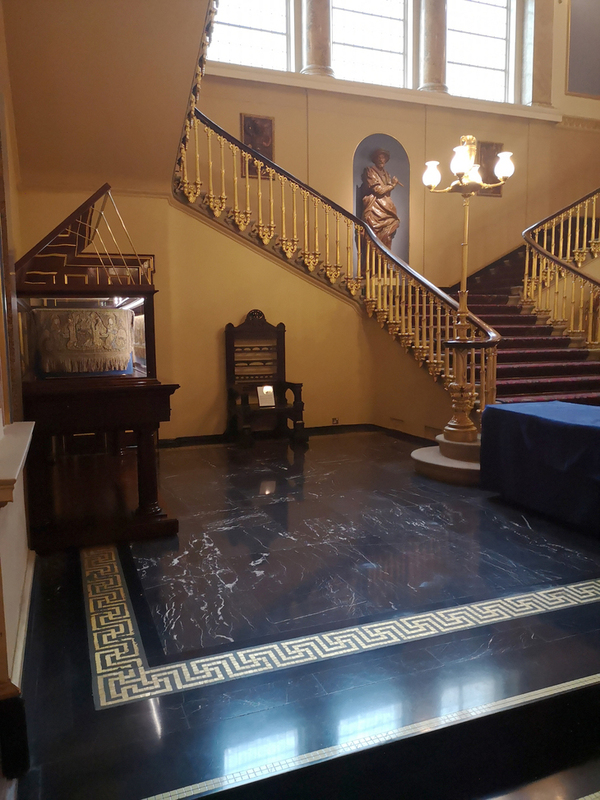 Up the gold balustraded staircase to the first floor, is a statue carved from elm in a blue niche. This is the stockfishmonger Sir William Walworth who stands clutching his dagger. Sir Walworth, like 45 other fishmongers between the 14th century and the present day, became Lord Mayor of London and distinguished himself by defending London Bridge against the Peasants' Revolt in 1381 led by Wat Tyler. No doubt skilled in boning, gutting and filleting, the mayoral fishmonger stabbed the rebel to death at Smithfield before the 14-year-old King Richard II. Wat Tyler’s head was covered in pitch and stuck on a spike on London Bridge, and Walworth received a knighthood and pension for his pains. Portrait of Herbert Clark, winner of the Doggett’s Coat and Badge Rowing Race in 1948. In the vestibule on the first floor is a portrait of one of the winners of the annual Doggett’s Coat and Badge Rowing race from 1948, Herbert Clark. The 300-year-old Doggett’s Coat and Badge Rowing race is the world’s oldest sporting fixture and takes place between London Bridge and Cadogan Pier. It is managed by the Worshipful Company of Fishmongers and was the brainchild of Thomas Doggett, an Irishman of theatrical bent, who co-managed what has become London’s oldest continuously working theatre in Drury Lane. He bequeathed a sum of money to pay for a prize costume for the winning waterman of a large silver badge embellished with a horse from the Hanoverian coat of arms, in celebration of King George I’s accession to the throne in 1714; it is worn on the arm, like a piece of obsolete armour, over a gorgeous scarlet tunic with ties at the calf and finished off by a peaked cap on the head. Vestibule window showing the coats of arms of members of the court, 1954. 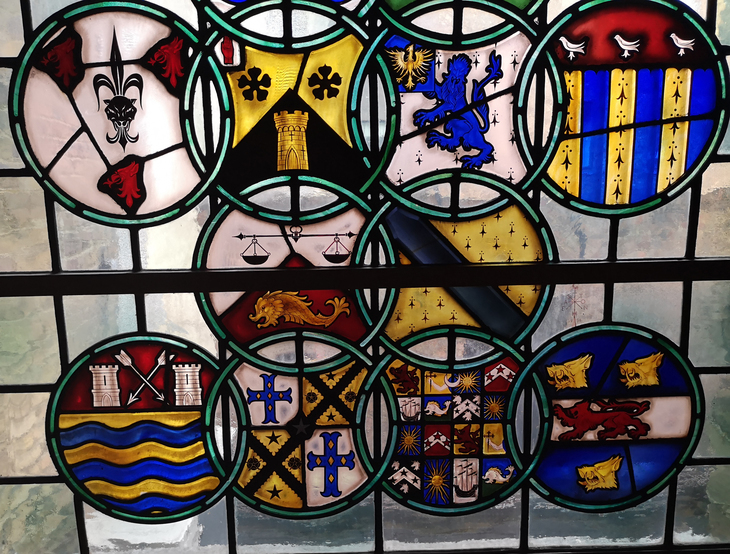 Detail of Vestibule window showing the coats of arms of members of the court, 1954. "I did all of the work but received none of the credit." 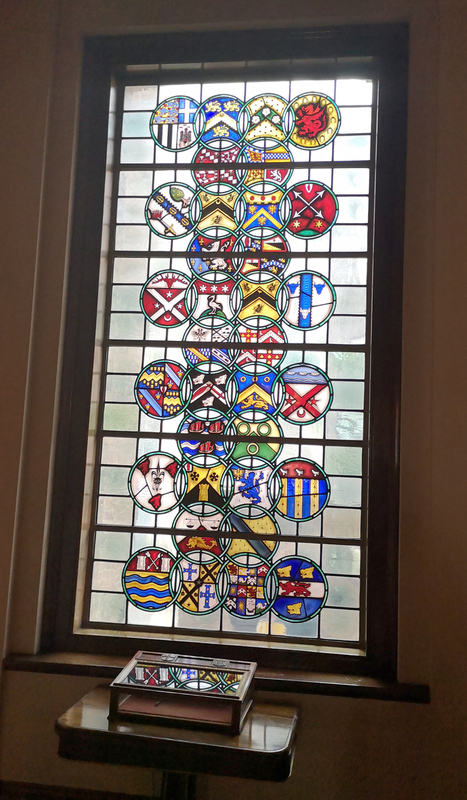 A vestibule window circled with 34 spheres contains the coats of arms belonging to members of the Court. 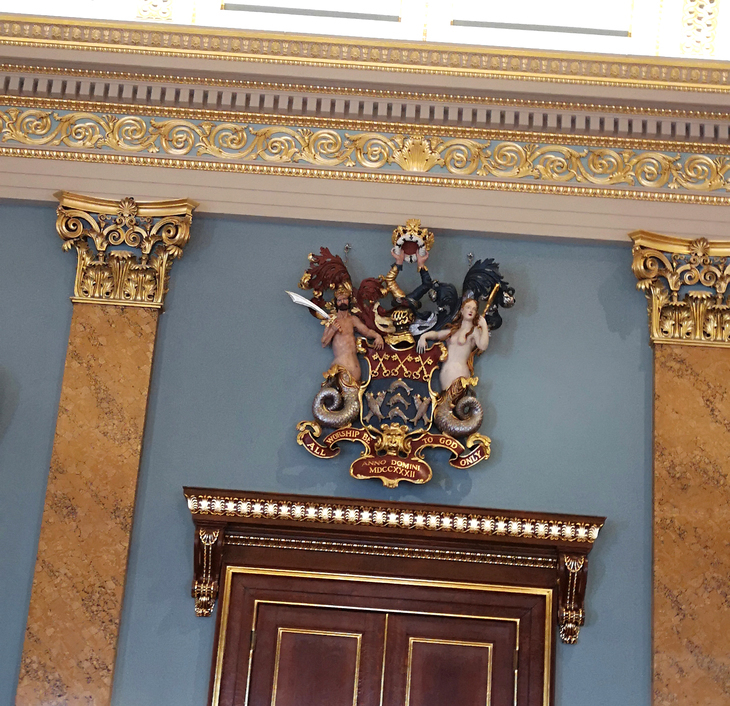 The Worshipful Company is governed by a Prime Warden, five additional Wardens and a Court of Assistants (a kind of board of trustees). Dating from 1954, this window contains a secret message etched in tiny resentful words in the glass by a tetchy apprentice: I Richard Meridale aged 18 did all of the work but received none of the credit. The Court Dining Room is where you sit down to silverware on white starched tablecloths and enjoy salmon, crab, lobster, monkfish or shrimp cooked up by the chef on the floor below. Fish was a source of great wealth as it featured strongly in Londoners’ diets over the centuries, particularly among the Catholic population who ate it on fast days. An Act of Parliament was passed during the reign of Edward III to regulate the trade of herrings; when whales were stranded in the river they were salted down for consumption by the king, and porpoises were the fish of choice on menus during Elizabethan times. London Bridge is also where the first fast food was served. In medieval times the bridge was crowded with hovels, and if the weary traveller ordered fish at an inn over the river it would be hauled up out of the Thames through a trapdoor by the cook. Here, the fish was fresh, but the air was foul. 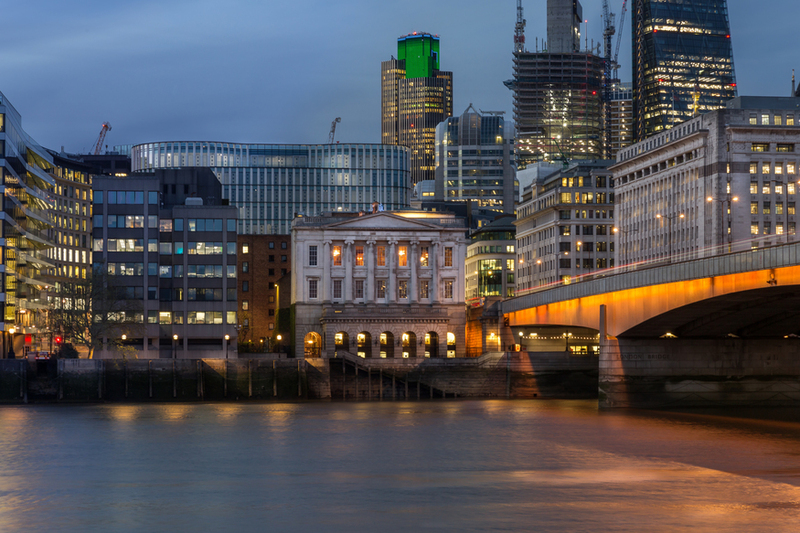 At Fishmongers’ Hall, the fish is still fresh and the air a little sweeter these days. Above the tables is a 1752 rococo chandelier. If it were to crash down like the chandelier in Phantom of the Opera, it would break into over 100 parts; luckily the joins are numbered so putting it back together wouldn’t be too challenging for the diners. Spot the gilt pineapple at the top, symbol of hospitality. One of the prize commissions of the Worshipful Company of Fishmongers is a 1955 egg tempera portrait of the young Queen Regent, Elizabeth II, on three pieces of paper by the Italian artist Pietro Annigoni. It hangs in the mint green Drawing Room, as if the walls themselves are a frame for the picture. There the young Queen stands in her robes of Star & Garter, against a misty landscape that looks more Flemish than English. 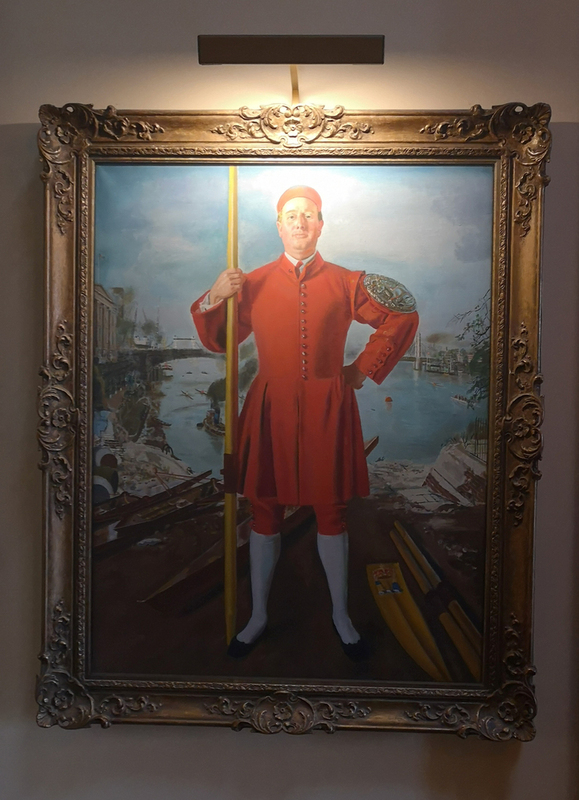 A small figure in a fishing boat in the background represents Annigoni, who almost refused the commission as he had never heard of the City Livery Companies and couldn’t think why a group of fishmongers would want such a work — or pay for it. 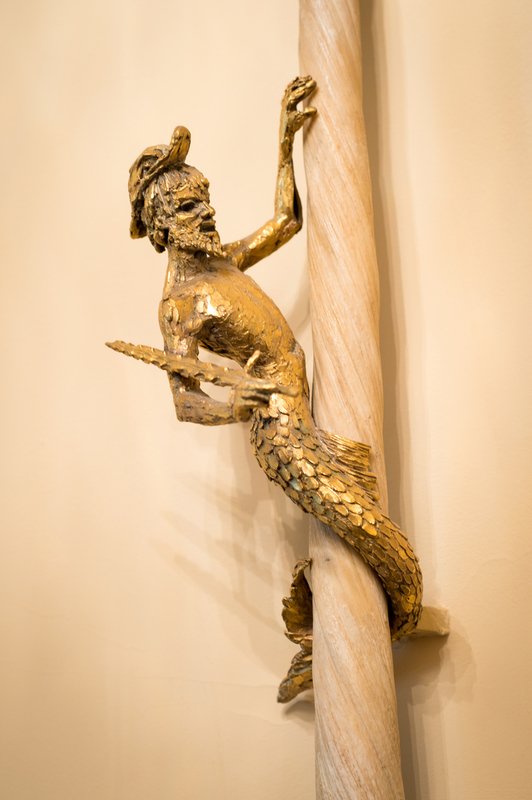 "The merman looks set to behead you"
The Banqueting Hall is a long powder blue room with curved coffered ceiling studded with plaster flowers and arcades of pilasters and columns of pinkish marble. It is the only one to retain its original roof after the bombings of the second world war. During the First World War the room was used by the Red Cross as a hospital ward, staffed by doctors and nurses from St Barts. An operating theatre was set up here and 1,135 wounded men passed through. Today, liveried staff serve luncheon to guild members surrounded by historic artefacts that help fuel the conversation. A particularly fanciful coat of arms that you might expect to find among the pages of Alice in Wonderland hangs above the Banqueting Hall’s doorway. The mermaid gazes lovingly into her mirror; the merman looks set to behead you should you come close to the keys of heaven and the bent arms arising from the knight’s helmet seem to buckle under the weight of the crown. 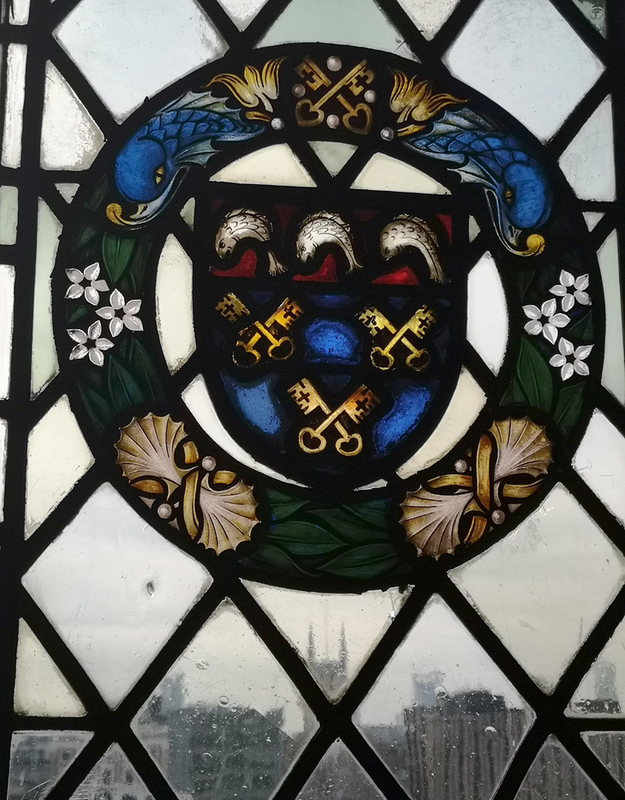 This 18th century coat of arms was originally fixed to the stern of a barge in the annual Lord Mayor’s Show on the river, which is why the processional carts are still called floats to this day. Old Billingsgate Fish Market on Lower Thames Street was one of two wharfs – the other being Queenhithe – where boats could dock and unload their cargoes. Billingsgate became the more important of the two in the 15th century when fishing boats increased in size, making it easier to moor there. 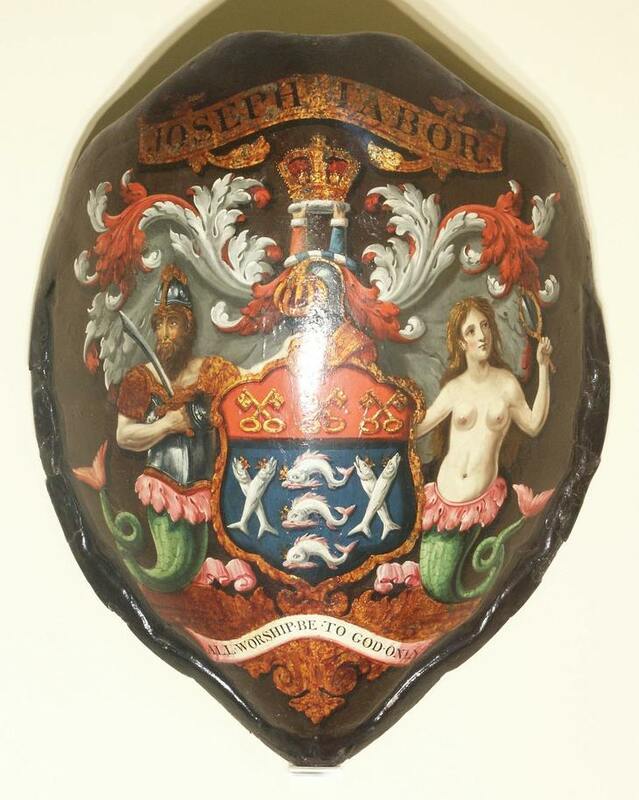 The Company’s turtle shell bearing its Coat of Arms dates from the 1800s and was an old sign for a turtle shop run by Joseph Pabor at Billingsgate at a time when it was okay to dine on turtle soup. 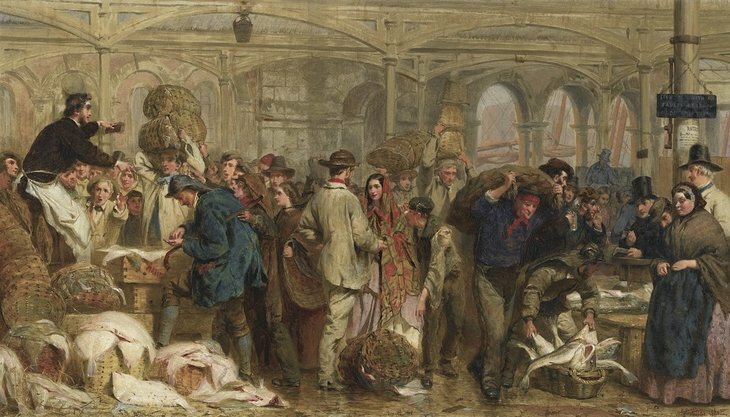 Hanging in the Court Room is a Victorian genre painting by George Elgar Hicks showing Billingsgate Fish Market in full throttle. Through the arcades you can see the ship masts against the river while porters bring in the catch of the day and a sailor struggles with a sack of something on his back. An auctioneer sells off the flat fish behind him and Cook from the grand house inspects the goods. At the centre is a young woman in plaid who has caught the eye of a porter in bobbin hat, and he has dropped his basket to talk to her, unaware that his load has spilled out on to the ground. The Court Room is the decision-making brain of Fish Hall. This is where the Prime Warden and his wife, Lady Fish, preside. 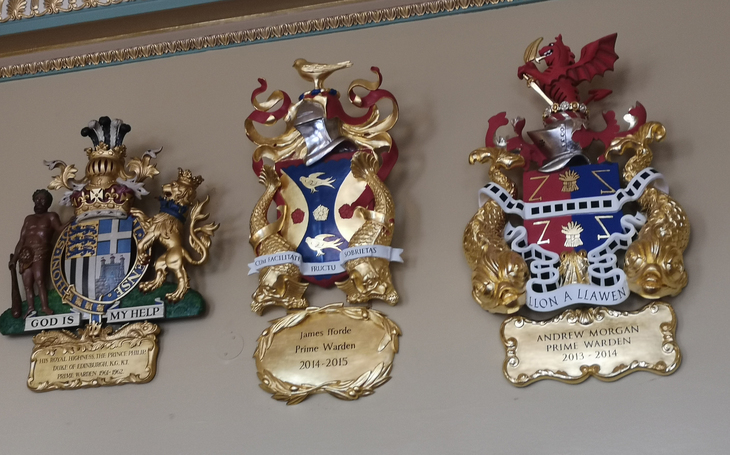 The walls are a feast of marine-themed paintings and the Coat of Arms of the most recent Prime Wardens also hang here. As with the Lord Mayor, the appointment of the Prime Warden is an annual term of office combining Company business with ceremonial duties. 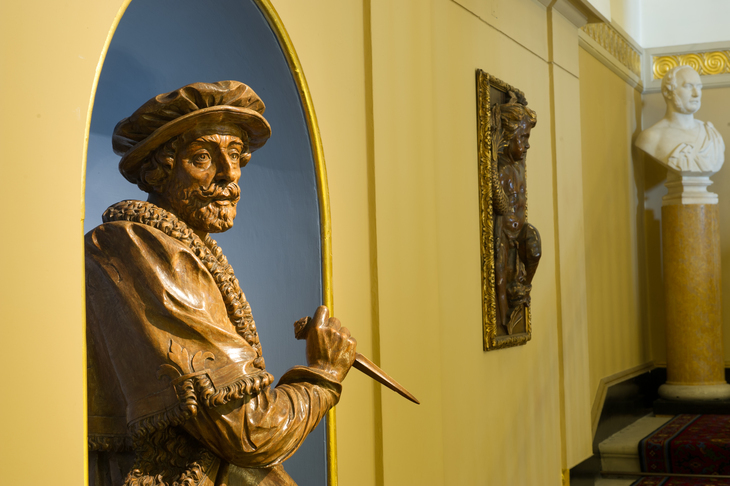 Since the 18th century, each new Prime Warden receives a memorial carving commissioned from the finest wood-carving student at the City and Guilds Art School. A scroll showing part of the procession for the Lord Mayor’s show in 1616. 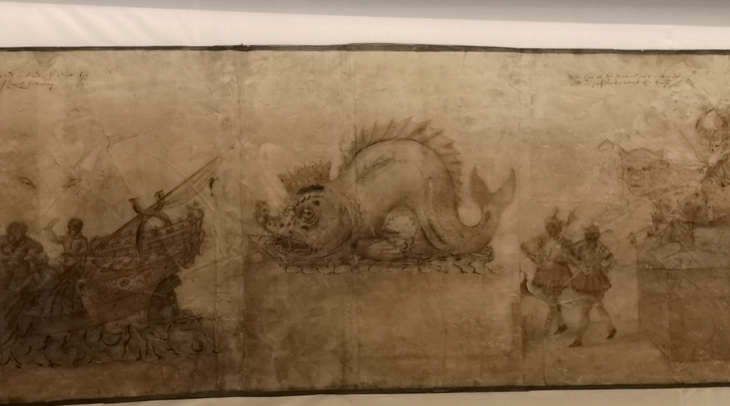 In the Library there’s a long scroll-like document dating from 1616 that depicts the Lord Mayor’s Show for the fishmonger Sir John Leman. 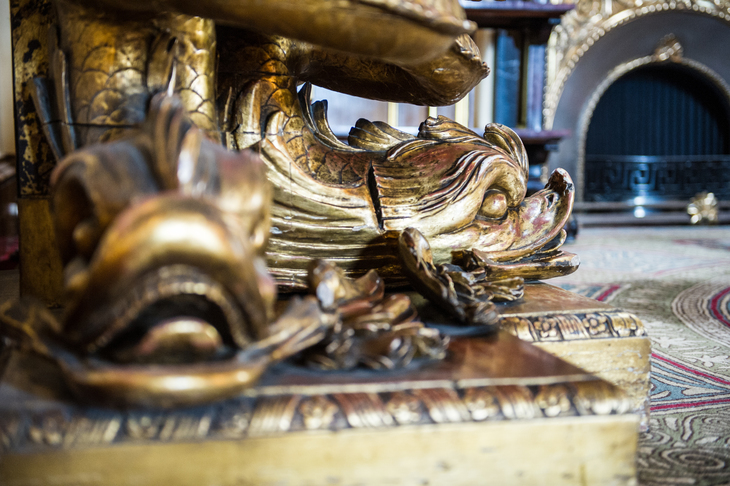 This section of the pageant shows a gigantic fish sculpture on the river, a heraldic dolphin that appears on the coats of arms for both the Lord Mayor and The Worshipful Company of Fishmongers. Although omitted from the drawing, a performer in the role of Arion rode on the dolphin’s back playing music during the pageant. Inside the float itself were the musicians. 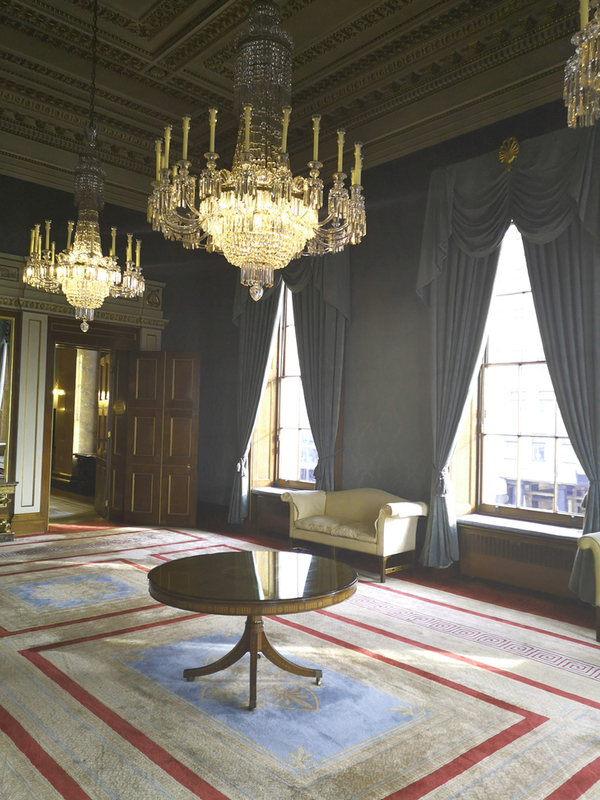 Fishmongers’ Hall opens its doors to the world for pre-booked tours. If you’d like to try out some of the dishes served up within its fish plush walls, the Company has published its own cook book: Simply Fish: The Fishmongers' Company Cook Book, for only the best is served at the fishmongers’ table.